The 2008 Group Show took place on October 19th, 2008. To view photos of the show, click here. The above is our poster in progress for the October 19th show. The paintings on the poster, from top to bottom are by artists, Linda Larsen, Kanna Aoki, David Miller, Sherrill Miller, Babara Lawrence and Kay Carlson. Food from Marin Organic family farms, wine and art available for purchase with 50% going back to the Marin Organic Interest-Free Loan Fund; a fund that is used by Marin Organic farmers and ranchers who are in direct, financial need. 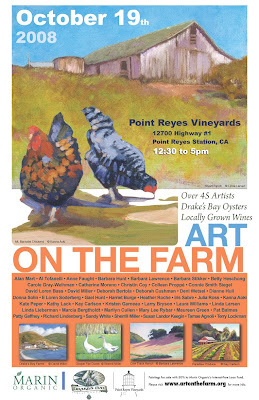 Point Reyes Vineyard is about 1 mile north of Point Reyes Station on Highway #1. For information about postcards for this show, either picking some up if you are an artist, or receiving one if you are a patron or would like to attend the show, please click here. 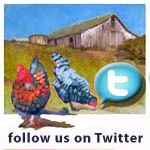 is a volunteer run, community- based partnership between artists and Marin Organic farmers. Artists visit, create, and draw inspiration from organic farms. Annual fundraising exhibits allow artists to give back to Farmers and Farm Studies Programs.